That is how graduating biology major Bethany Bruno began the personal statement that accompanied her medical school applications. What do tutus and Tinker Bell have to do with medicine? A lot. 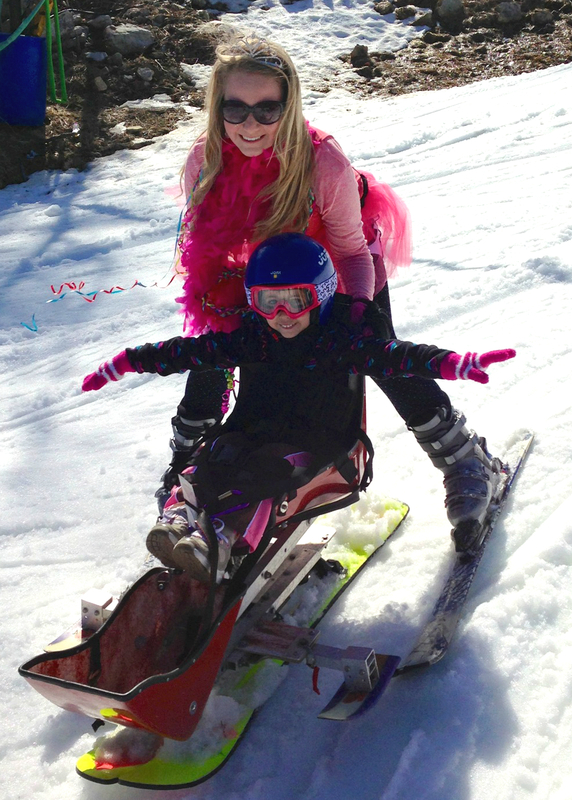 Bruno is describing a downhill skiing run she shared with Emma, a 6-year-old with spina bifida, during Therapeutic Adventures’ annual Independence Cup race. Working through Madison House, Bruno has coordinated 40 volunteers for the adaptive ski program all four of her years at UVA. “The program lets us share our love of skiing with people who otherwise might never get to experience the thrill of flying down a mountain,” she said. During Bruno’s time at the University, through volunteering with children and working with doctors in the UVA Medical Center’s emergency room, she has learned that it’s the personal touch, and a touch of heart, that make a great doctor. At UVA, she dove into laboratory research through the Virginia International Genetically Engineered Machine team, winning a gold medal at a North American jamboree held in Toronto. She found that she loved working in a lab. But along the way she realized that medicine goes beyond the results of science. It’s about “establishing healing relationships with patients that improve quality of life,” she said. “Science may never solve all major medical problems, but medicine can still provide small miracles by focusing holistically on each patient as a person,” she said. She witnessed one such miracle when skiing with Doug, a 28-year-old paraplegic who zoomed past amazed skiers on a mono-ski down one of the steepest, most difficult slopes. Bruno realized that “medication, therapy and a little encouragement” helped him do this, and that active engagement with patients involves trust and collaboration. To further her experience with patients, Bruno took a job as a medical scribe in UVA’s emergency room. A scribe works closely with physicians, observing patient interviews and documenting pertinent information in the electronic medical record. This has offered Bruno firsthand encounters with people from all walks of life who seek treatment for a range of medical issues – some very serious, and some requiring little more than a bandage. And she has observed the medical professionals who are providing the best care possible in a fast-paced setting that requires plenty of triage. Bruno is able to witness “people at their best and worst,” she said. Her experiences have led to a strong interest in biomedical ethics, and a minor in that area. Bruno completed a summer fellowship last year in biomedical ethics research at the Mayo Clinic and earned a summer ethics internship award from UVA’s Institute for Practical Ethics and Public Life. 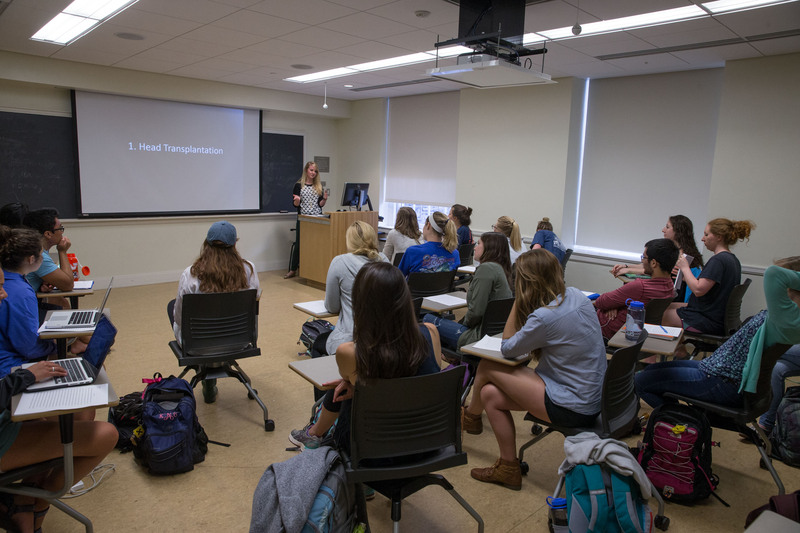 This semester, she is teaching an undergraduate seminar on the ethics of organ transplantation. “Having seen doctors grapple with the limits of professionalism, health care resource allocation and decisions regarding end-of-life care, I know that my biomedical ethics knowledge will be part of my everyday work as a physician, enabling me to take the best possible care of my patients,” she said. When Bruno isn’t teaching or skiing or scribing, she plays the harp as a creative outlet. 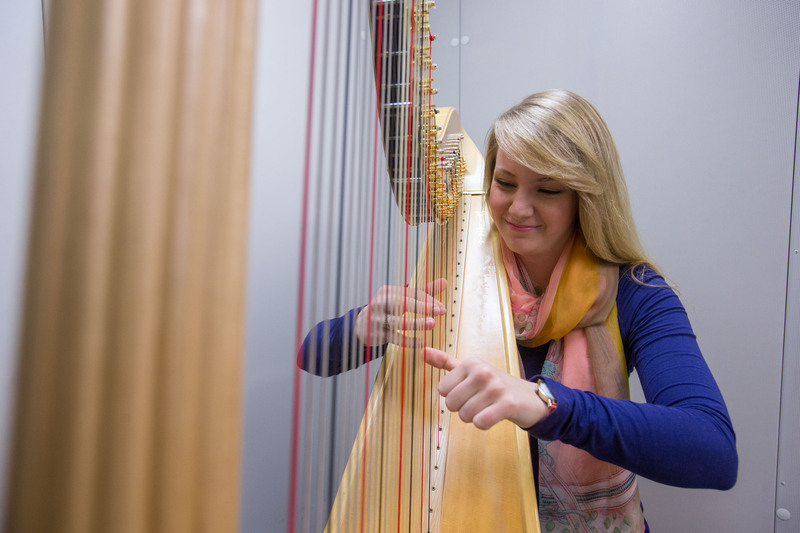 She began taking lessons in the fifth grade before joining the American Youth Harp Ensemble two years later. The group has performed at Carnegie Hall, the Kennedy Center, the White House and in London and Vienna. Bruno came to UVA as a U.S. Presidential Scholar, National Merit Scholar and Echols Scholar. She has won three additional scholarships and is a Raven Society member. She’s proud to note that her mother is an alumna of the McIntire School of Commerce, and her sister is a third-year commerce student. After gaining admittance to 11 medical schools, Bruno has accepted a full scholarship to the Cleveland Clinic Lerner College of Medicine of Case Western Reserve University, beginning in July. She said she will bring with her the stimulating experiences that have shaped her at UVA, and memories of the people who have inspired her and helped her develop – patients, physicians, professors and fellow students.